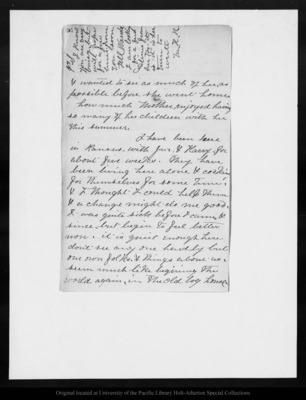 Letter from Maggie R. [Margaret Muir Reid] to John Muir, 1888 Sep 29. [in margin: P.S. I know you are very busy, but will hope for a few lines from you soon. Tell Wanda I am looking for a few lines from her too. it is her turn to write M.H.R. ]& wanted to see as much of her, as possible before she went home how much Mother enjoyed having so many of her children with her this summer.I have been here in Kansas with J[illegible] & Harry for about five weeks. they have been living here alone & cooking for themselves for some time. & I thought I could help them & a change might do me good. I was quite sick before & came [illegible]since, but begin to feel better now. it is quiet enough here don't see any one hardly but our own folk. & things above us seem much like beginning the world again, in the old log house. Original letter dimensions: 20.5 x 12.5 cm.